The fascinating and well-researched published story by Bob Lochte is that our family came to Murray, KY to claim a land grant that was given after the Revolutionary War (although the story that I have heard is they came over as indentured servants). Nathan was born in 1860 to a wealthy attorney. He becomes a melon farmer but is also well known around town for his patents. He created telephone system which enjoyed moderate success until Bell Telephone put him out of business. The published story is that he lost too many customers to Bell, although the story I have heard is that Bell Telephone stopped him. In 1892 he created a wireless telephone that sent signals through the ground, and two years later Marconi does a similar, but wholly more successful invention of sending signals through space. Nathan’s “wireless telephone” would have never seen enough power to broadcast great distances. Nathan wasn’t trying to create a radio, but instead exactly what he did invent – the wireless telephone. It confuses me still why people still argue that he created the radio when a) he didn’t and b) he wasn’t working on. Nathan gained national attention for his wireless telephone, but when he was called upon to demonstrate it in New York City, the connection failed. He returned home to Murray ashamed, and became a recluse for the remainder of his life. He was found starved to death in 1892. Of course, the story I’ve heard is that he drunkenly blabbed about his inventions he was working on, they were stolen and he drank himself to death – which I guess is an even more sad starvation than lack of food. 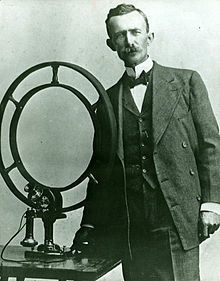 Stubblefield’s inventions did not lead directly to radio as the technology works today, but the public demonstrations in 1902 and the press coverage in the New York Times, the Philadelphia Inquirer, the Washington Post, the Louisville Courier-Journal, Scientific American, and elsewhere helped to spur public interest in the possibilities of wireless transmission of voice and music. Most other inventors of the era sought to provide point-to-point messaging, to compete with telephone and telegraph companies. Stubblefield in the 1902 was in a sense the “Father of Broadcasting”, in that he said to the St. Louis Post Dispatch reporter in 1902, “..it is capable of sending simultaneous messages from a central distributing station over a very wide territory. For instance, anyone having a receiving instrument, which would consist merely of a telephone receiver and a signalling gong, could, upon being signalled by a transmitting station in Washington, or nearer, if advisable, be informed of weather news. My apparatus is capable of sending out a gong signal, as well as voice messages. Eventually, it will be used for the general transmission of news of every description”.